Reyzurbetsonthiscat has won the Classic open at “the Ike” with Craig Thompson aboard. Bet Sheza Marka was also a finalist in the Classic Open and won the Classic Novice Open. CONGRATULATIONS to Barnwell Ramsey on marking a 222 for a 4.5-point win in the Rios of Mercedes Amateur finals Tuesday at the Jerry's Chevrolet NCHA Futurity presented by Great American Insurance. He rode Reyzurbetsonthiscat, a Bet Hesa Cat gelding bred by Linda Holsey. The gelding is out of Ariel Rey, a mare Kathy Daughn rode to win the West Texas Futurity, and an earner of $99,000. Ariel Rey's babies include Melodys Pepto ($135,000) and Jay Moss Cougar ($120,000). 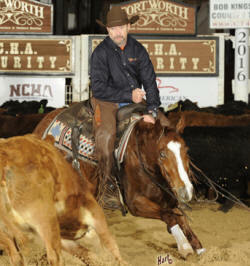 Ramsey has been a finalist seven times at the Super Stakes and NCHA Summer Spectacular, but this was his first NCHA Futurity finals. He's also a semi-finalist in Wednesday's Unlimited Amateur. 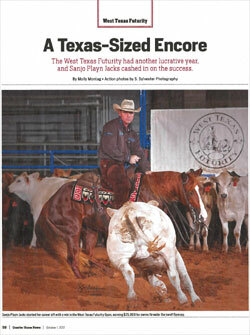 Sanjo Play was featured in the Nov 1 issue of Quarter Horse News. Click on article to read. Wolf Den Farm was established in 1875 and the original farmhouse after several renovations is still a large part of its foundation. Between the years of 1972 and 1992 it was no longer farmed and a large part of the original 1000 acres was sold. In 1992 reconstruction of the farmhouse was begun and in 2002 the farm activities of raising horses and cattle began. Wolf Den Farm now consists of 100 of the original acres as the basis of its operation as well as 400 acres of leased and owned land in both South Carolina and North Carolina. The primary goal of Wolf Den Farm has been to raise and offer good quality quarter horses for sale based on solid foundation stock. 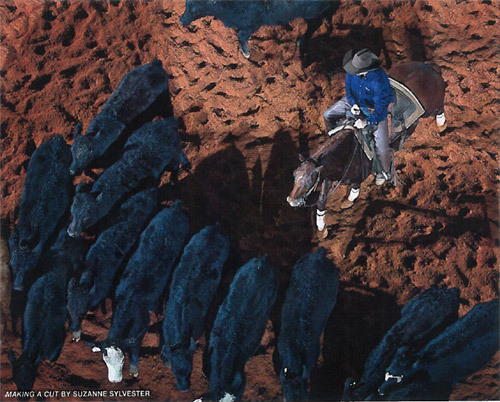 The cattle farming activity revolves around the need for cattle to effectively train young cow horses and to maintain and offer show horses for sale that are involved in the cutting, roping, working cow horse, reining, sorting, and team penning events. Smart Lil Rick, a son of Smart Lil Ricochet and a grand son of Smart Little Lena provides the basis for our breeding program. Each year we have steadily increased the quality of the broodmare herd. Our mare band now includes daughters of Dual Pep, Chula Dual, Playdox, Smart Aristocrat, Smart Little Jaebar, Pepto Stylish Oak, Gallo del Cielo (Rooster), and Shorty Lena making a strong foundation for a cutting/cow horse program. More and more young horses are excelling in the show pen as well as being exceptional all around equine athletes. Sanjo Play won the 2010 Brazos Bash Open Futurity with Craig Thompson aboard! Peptos Stylish Pancho won the 2009 Southern Cutting Horse Futurity with Craig Thompson aboard! Adobe Flash Player is Required to View Movies on this Website. 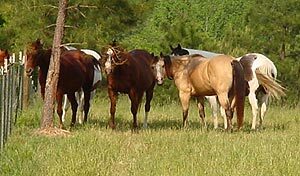 We have a good selection of cutting horses for sale as well as just good all around cow horses for sale. We present an excellent opportunity for you find young horses at all ages and skill levels and training for you to enjoy in various equine activities. Wolf Den Farm. All Rights Reserved. our links Site Designed and Hosted by Big Sky Internet Design.